I have always thought about what makes some people look better than others — at the individual, ethnic, and national level. 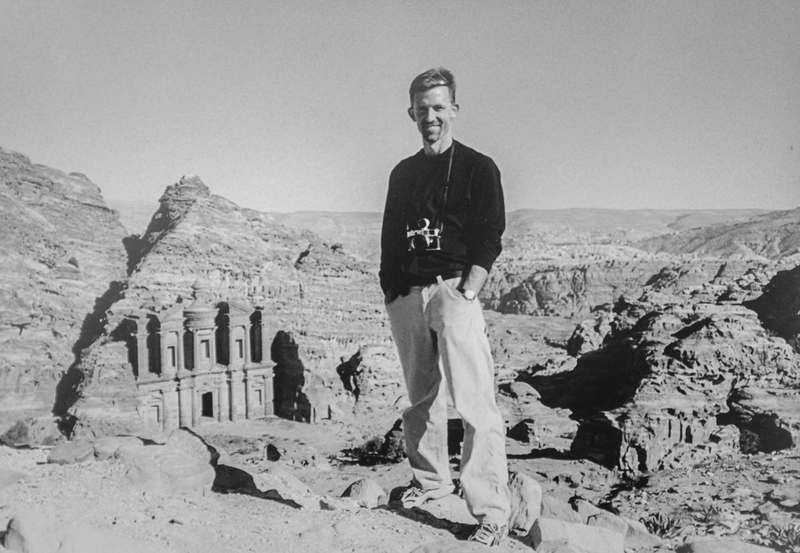 Having travelled on six continents, I have been able to test ideas and stereotypes—including my own—through personal observations. Is “Jenny,” who I saw on a YouTube video teaching yoga-type exercises, good looking because she is Swedish, and if so, what does that mean? This all came back to me last night while I was surfing YouTube for a video on ski waxing, where I, yes, got distracted by what looked like a very healthy and attractive woman doing yoga. Instead of it being a yoga tutorial, it was a video published by two young Swedish women that is mostly a product of personal vanity and that natural desire to express one’s self. I believe their names are Jenny and Andrea, and they appear to have a preoccupation with their admittedly very good looks. I cannot fault them for that. Yes, these two are very physically attractive. But I again thought about why? Why are many Swedish and other Scandinavian women I have met so attractive? First, I do not ascribe to the idea of “national beauty” or the national ranking systems that have little scientific validity. Social and popular media are obsessed with the idea that Swedish women are among the world’s most beautiful. A dubious online source called Traveller’s Digest claims Sweden tops their list of countries with the hottest looking women. (The country’s men also rank No. 1). Such rankings amount to Internet silliness. I traveled to Sweden in 1990 for about a week, staying with friends I met in India (Eva and Eva — yes the real names). I found many people I met there to be healthy and attractive, but not to an extreme. I did find an excessive amount of out of control binge drinking in the social circles my generous hosts ran with, particularly among college-age and slightly older Swedes. In fact, globally, I have found few places that matched the excessive drinking I saw all over Sweden. I also have seen Swedes globally, and in general many do appear more fit and healthier than the typical American, who rightly has earned a reputation as being overweight and thus unhealthy, and therefore unattractive in the eyes of many. Such data is borne out by national health statistics, as America is the fattest country on the planet, and because of that, my country does not have the reputation as Sweden does for the hottest men and hottest women, I think. One of the most ubiquitous stereotypes of nationalities is that of “hot” Swedish women–perpetuated by photos like this one. Globally, Sweden does very well in terms of health rankings and public health investments. Sweden scores highly in terms of life expectancy from birth, ranking No. 16 among all countries (81.8 years). Its Nordic neighbor, Norway, ranks 25th (80.32 years). The United States fares worse than both, and Jordan, and New Zealand, and, well, 50 other countries, at 78.5 years. By comparison the much poorer Cuba, with a vastly lower standard of living (less than 20% of the United States per capita), ranks No. 60, with a life expectancy of 77.9 years. In 2010, according to the World Bank, Sweden spent 9.6% of its GDP on public and private health, including preventive and curative services, family planning activities, nutrition activities, and emergency aid designated for health but not water and sanitation. Norway spent nearly the same amount, or 9.5%, while the United States was staggeringly inefficient, spending 17.9% of its GDP, and the trend is getting worse. 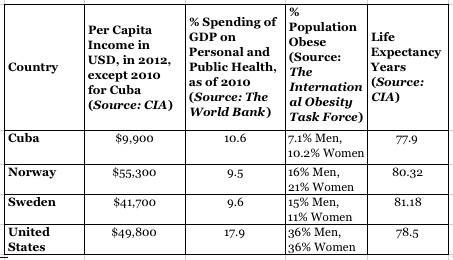 The socialist and undemocratic Cuba, which invests heavily in public health for its population, spent a mere 10.6% of its GDP, but had nearly the same life expectancy per person as its mighty northern neighbor, America. So even though the United States spends nearly twice as much as these three countries, it does not have results to show for it. Such discrepancies are frequently cited highlighting how grossly inefficient U.S. health care is compared to countries with strong government-backed and financed health systems. But do such investments have anything to do with physical appearance, and thus beauty? Well, expanding waist lines and bulging bottoms, which nearly most people globally do not view as physically attractive, seem to indicate that Americans are likely to be less attractive than Cubans, Norwegians, and those stereotypically “hot” Swedes. The International Obesity Task Force estimates that, globally, 1 billion adults are overweight (BMI 25-29.9 kg/m2) and 475 million are obese. In the United States, two-thirds of all residents are obese or overweight. The United States is the world’s heaviest country per person–a dismal and frighteningly scary statistic for our healthcare system and for future incidence of many of our top killers (cancer, heart disease, as well as diabetes, though further down the list). So why, say, is Sweden doing better than many countries and the United States. For starters, everyone in Sweden has equal access to health care services under a decentralized, taxpayer system. The Swedish Institute reports that every city council “must work to promote good health for the entire population.” Again, this is a vastly different value system than the United States’, where taxes are viewed with increasing hostility by the political right and where individuals are still, for the most part, considered responsible for their health. 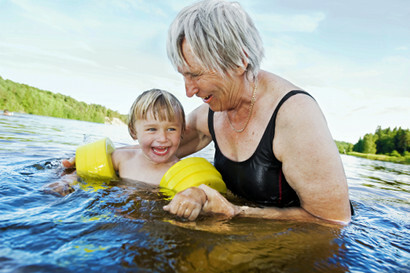 This photo published by the Swedish Institute highlights a view of health, from youth to old age, and by most measures, Swedes are healthier and live longer than Americans. In Sweden the responsibility for health and medical care is a shared responsibility of the central government, county councils, and municipalities. The country’s Health and Medical Service Act regulates the roles of county councils and municipalities, and it gives local governments freedom in this area, while the central government sets principles and guidelines for health and medical care. What’s more, Sweden’s maternal mortality, another key public health indicator, is among the world’s lowest: 2.74 in 1,000 babies and less than than 1 woman out of 100,000 die in birth. “Swedish maternal care is often highlighted as a success story in international contexts,” boasts the Swedish Institute. By comparison, the United States infant mortality rate is 6 per 1,000 (bested by Cuba’s 4.73 per 1,000). So in the end, you have a country that invests more in its people and in the health of its people, who likely have a good chance of being active and also avoiding stigma associated with excessive weight. It’s not so much that Swedish women, like Jenny in the exercise video, is anything extraordinary, though she is very attractive because she is healthy. She is, perhaps without her full awareness, the recipient of extensive investments in her education, her health from cradle to grave, and a social contract that values the well-being of the population. 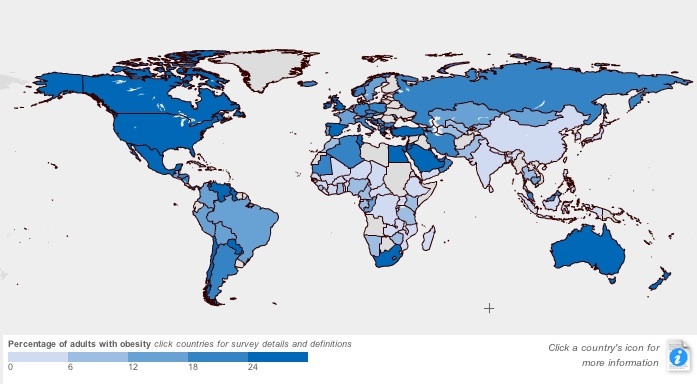 The International Obesity Task Force published this map of obesity rates globally; some data likely is missing for African nations. And how do we react when we see Swedes, on YouTube or traveling abroad, or in business or education settings? We react positively. An August 2012 story published in Psychology Today (“I’m Successful Because I’m Beautiful”– How we Discriminate in Favor of Attractive People) highlighted some frequently cited studies on how specific physical traits are rewarded. Still, obesity is afflicting even the Nordic countries, which has universal health care and strong safety nets. A 2010 study by Kirsti Matlerud and Kjersti Ulrisken in the journal Patient Education and Counseling (“Norwegians fear fatness more than anything else”–A qualitative study of normative newspaper message on obesity and health) looked at how newspapers in that affluent country sent messages on body weight. They found in a public survey, when people were asked what health problems they would like the health authorities to give priority to, obesity ranked highest, and then followed by care for the elderly, cancer, psychiatry, and cardiovascular disease. They also reported a general attitude of fatness being associated with being lazy and irresponsible. So yes, they do care about their looks in Nordic nations and discriminate against overweight persons, much the way we do in the United States. They just do a better job of ensuring their population stays healthier. Jenny and Andrea have reaped the benefits and get the added benefits of being viewed as attractive and being seen more favorably than those who have not had a national health system ensuring its population has the best possible chance of being healthy. Next Article Do community health fairs really make any difference at all?